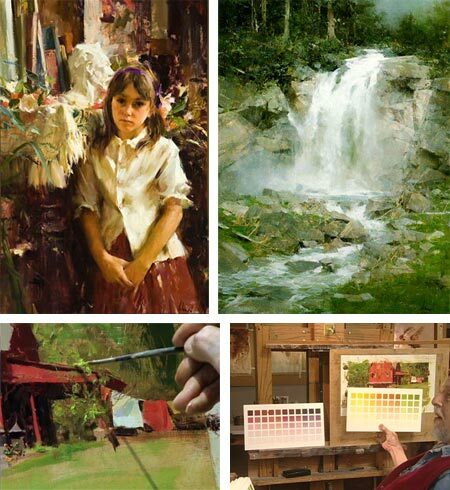 Richard Schmid, though a well known and well respected contemporary American painter, is perhaps even better known as a teacher, through his widely read book and, more recently, series of instructional videos. His web site doesn’t do much to change this, in that the images of his work, though presented well enough, are frustratingly small. At least they’re frustrating to me, as I’m particularly interested in his economical and beautifully handled brush work, which you can only really appreciate in large images. You can still see in the reproductions his beautiful handling of color and value, his remarkable ability with “lost and found” edges, and his wonderful control of texture, light and atmosphere. When viewing work on his site, there are images in the Lithographs section in addition to Available Work and Archive Gallery. Schmid paints alla prima; an a Italian phrase meaning “at once” or “at the first”, that defines the kind of painting done all in one session while the paint is wet, as opposed to the layers of paint used in classical painting. Most “plein air” painting (see my recent post on pochade boxes) is done alla prima. Whether the subtitle is true, I don’t know. I suspect Schmid knows considerably more about painting than can be put in one book, but the book is valuable and he has put a great deal of information into its 200 or so pages. This is not a painting instruction book in the sense of “here is what brush to use” and “here’s how to paint water”. Neither is it conceptual in the manner of books by Hawthorne or Henri, it’s somewhere between those two types of painting books, simultaneously high-concept and down to earth instructional. The book is divided into chapters like “Starting”, “Values”, “Edges”, “Color and Light” and “Composition”, that are filled with both both practical techniques and food for thought about your approach and intent, with the end goal of using the natural world as your final arbiter in choosing colors, arranging compositions and conveying light and atmosphere. Not that Schmid is slavishly realistic, far from it. His paintings are quite poetic, but they are based firmly in direct observation of the visual world. Occasionally you may find him waxing philosophical; and you might disagree with some of his pronouncements. For instance he asserts that there are no such thing as “neutralized” colors; and while I understand his argument, I think it’s a matter of semantics and the term is a useful one. I disagree with him in a number of areas, but bear in mind that he is a better painter than I by a couple orders of magnitude (grin). My impression of Schmid, and his sometimes lofty tone of voice in the book, was dramatically softened when I watched one of his videos, in which his personal demeanor and tone are much more appealing. Schmid has a series of four instructional landscape DVDs and one on portraiture. I’ve seen the second in the series, Richard Schmid Paints the Landscape: June (bottom two images, above), and I found it well done, well paced and full of useful information and techniques; particularly for those who are painting alla prima, en plen air (I’m just having fun with painting terms today). Unlike some instructional videos, this one proceeds at a relaxed pace, in keeping with a pace appropriate for the mindset of painting, and allowing time to see a great deal of his painting process in detail. It’s truncated in places, but the jumps are artfully chosen. The shoot is well directed, dwelling where appropriate on his palette and color mixing process, with close ups of the canvas and shots of the subject that emphasize the points he makes while painting. The DVD has two parts, the first is a complete on location painting session, from sketch to finished painting, and the second, in the studio, revisits the painting for analysis and goes beyond; into a discussion of color range and the control of edges and color transitions that alone is worthwhile as an instructional video. 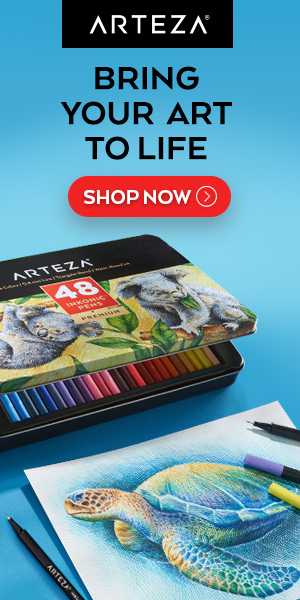 Like similar art instruction videos, these are not inexpensive ($75), and the site doesn’t give you a preview video clip to let you know how you might like it (which I think would be a good selling point), though it does offer a few stills from each video. There is a brief excerpt from one of his videos on YouTube, unfortunately, it’s not a very good or representational segment, and the video compression distorts the image quality, so I wouldn’t judge the videos by it. Another nice thing about his videos is that you finally get to see his brushwork close up, something that is missing even in the book. In both his book and videos, Schmid emphasizes some fundamentals that are often glossed over, but are worth being reminded of. One in particular is “doing the charts”; a process that young art students often think is onerous busywork, but seasoned painters know is as invaluable to a painter as practicing scales is to a musician. This is the process of painting your own color charts, in which you mix a value scale of each color, and then value scales of each color in combination with each of the other colors in your basic palette. It is a process that gives you more color mixing knowledge than a truckload of color mixing books and preprinted charts could ever begin to provide. It is this kind of adherence to the time tested painting fundamentals, that work and have been successful for representational painters through history, that is the basis for both Schmid’s teaching and his beautifully economical and lyrically poetic paintings. Richard Schmid isn’t primarily known as a teacher–he is primarily known as a painter, the best of the realists that are out there painting today. The only reason more people don’t know about him is that he isn’t promoted in the “art” magazines (which are really run by the galleries, since they pay for all the advertising). He shows his work in one gallery (Westwind Fine Art), and doesn’t need to advertise himself to collectors, who have known about his great work for decades. I was just speaking to a few artists who have DVDs out there for purchase, including Jeremy Lipking and Casey Baugh, who collaborated with Schmid to make his DVDs. They aren’t huge fans of SmartFlix. Unlike regular video stores who must pay a usage fee to the movie studios to offer the movies they rent, SmartFlix does not. In other words, though it is nice that SmartFlix purchases the DVDs from the artists, once they are in SmartFlix’s hands, the artists never receive another cent, no matter how often the video is rented. These artists put up their own money to produce these instructional videos, and it often takes thousands of sales before they can break even. It becomes much harder when these items are out for rent, with no royalties paid back to the artist. Jeremy’s studio turned down a large order from SmartFlix just so they could protect their investment in his DVD. He plans on using the profit from his video sales to make more films, and we’d all like to see that. What SmartFlix does is by no means illegal, and I don’t want to leave that impression. However, I do hope that people will buy the DVDs, rather than rent them from SmartFlix. There is no doubt that these instructional videos are expensive, but if I were in the position that these other artists are in, I too would want to control my profits. And in the meantime, I will pay the extra to get these great videos which I can watch over and over. In the long-run, it is cheaper than traveling to a workshop, paying for the instruction, and paying for lodging. If you do rent from SmartFlix (and I know how tempting it is), then I do hope you eventually buy at least some of the DVDs directly from the artist. Thanks, Matt. I wasn’t aware that SmartFlix has a different arrangement than traditional video rental services. I’l bear that in mind when I get around to reviewing the service. I understand the high cost of individual artists paying to produce an instructional video, and I would like to encourage those who find their instruction useful to support them. Far be it from me to want to take money out of the pocket an artist who has gone to the effort to share their skills in a well-produced instructional video, because I applaud the practice. However, on the other end of the equation, these are expensive videos; particularly when you are expecting the purchaser to make a “leap of faith” and pay $75, $80, or more for an instructional video, sight unseen, on the basis of the artist’s reputation; with no knowledge of the production values and usefulness of the video itself. This is why I suggested in the article that renting an instructional video in order to to preview it is was an “extra expense”, rather than an alternative to buying the video. Most people who find this kind of video helpful would want the ability to watch it repeatedly, and a $15 rental is a good chunk of the $75 price. Repeated rentals of the same video would be impractical. However, renting one video by a particular artist would be a worthwhile expense to judge if that artist’s productions in general were indeed watchable and instructive before laying out the full price of a DVD. If the video is not what they need or want, they haven’t put their $80 in the wrong place; and may find another artist’s videos of more value for their individual needs. As I also suggested in the article, artists and producers of instructional videos could help themselves out, circumvent this question to a large degree, and add an additional sales tool for their videos, by providing short (5 minute) excerpts, from which potential buyers could judge the quality and usefulness of the video offerings. Sometimes artists play their cards too close to their chest out of fear of being “taken advantage of”, putting me in mind of book and magazine shop owners, before the advent of the chain stores, who would cruise their aisles proclaiming “this is not a library” on the erroneous assumption that browsing would somehow lead to reduced sales, instead of the opposite. I’m very surprised that Matt suggests that what Smartflix is doing is legal. Over here in the UK all such videos and DVDs come with injunctions not to copy, rent etc – in other words the legal position is that the only person who can view is the person who bought it – and buying to rent as a commercial proposition would require (I think) a licence. I do like Richard Schmid’s work – and I never see his Alla Prima book over here no matter how hard I look. I suspect one of these days I’m going to have to fork out for international shipping! However I may just wait until next year after the publication of his new Landscape painting book…. I’m not clear how the video rental system works in terms of licensing. It may not matter what a video says on it if not backed up by a specific item in the law. I don’t know if the new Landscape book is instructional or a collection, though it should be worthwhile in either case. I agree with everything you have said. These videos are expensive, and it’s hard to tell what you’re getting when you’re buying blind. I have several that were just short of $200 each, and though I am happy with them, it was a scary gamble waiting to see what I had bought. It would be good if we artists who bought DVDs in the past, would post reviews and descriptions (as student/viewers) of our purchases to help others make their choice. Your suggestion of posting video excerpts on the sales sites is a good one, and I hope more people follow up on that practice. I didn’t miss your comment that you used the rental service as a prelude to buying; my comment was more geared to your regular readers (like myself) who might not take the next step and buy from the artist. I meant no insult. Like many, I didn’t realize how these rental sites might be harming the artists who created the DVDs until I heard it from the artists themselves just a few weeks ago. Unfortunately, Katherine, from what I gathered from those other artists, what SmartFlix is doing in not illegal. I believe they fall into an educational service category, and are not lumped together with stores which rent for entertainment purposes. Somehow, I guess this provides them with a loophole to nestle into. I don’t like it much either. At least SmartFlix buys the DVDs from the artists; Casey’s DVD is apparently now available online for free in its entirety from both a Chinese and a Japanese site so there are many people watching his stuff with no investment in his work at all. Incidentally, Charley, which Schmid DVD are you considering? I have Sequential Sketches, and though it is a nice retrospective of Richard’s work, I think the description on the site is a bit misleading. There aren’t very “many” images shown in sequence from beginning to end, only a few, and Richard doesn’t go into depth explaining them. It is purely a showcase of his work (and therefore beautiful), but not means meant as an instructional video. (figured I’d put my money where my mouth is). I’ll probably get the DVD I rented, Richard Schmid Paints the landscape: June because I found it uesful, particularly the information on edges and handling them with a painting knife, though I may opt for another in the Landscape series. Maybe I’m different form other people, but I’ve never let the fact that a book is available in a library dissuade me from buying my own copy if I like it, and I’ve never let renting a video deter me from buying my own copy if I want to see it more than once (and I’m not a spendthrift, my book and DVD purchases are budgeted). In fact, with rare exceptions, I only buy DVD’s of movies I’ve already seen. How else would know I want to own it and watch it repeatedly? Amazing POST! I’m busy today but will take time to digest all the links. I have his book on Alla Prima-Everything I know about painting, it is one of the best books on painting I have read till date if NOT THE BEST! My only problem has been not having the patience to do his all divine colours studies with my palette colours! I think the key to doing the charts is to do them a little at a time, they don’t have to be a big all at once project. I notice you’re in London, UK. Did you find a copy of Alla Prima locally or did you order it from the U.S.? Other readers can see Adebanji Alade’s blog, in which he posts his own plein air paintings and sketches, here. What a wealth of info for someone like myself. Thanks! I think about 4 years ago I got it ordered from the U.S. It wasn’t available in the UK at that time and I don’t think it is available at the moment in the UK. Thanks for the advice about the colour charts, that will surely help me! I think 2 colours per month will be better a start than not doing them at all since I’ve read the book. I really appreciate the mention too! I decided this summer to take my time and become one of his students (alas, so far only through re-reading his book). I’ve done the color charts once before some time ago and have recently begun to do them again with my current palette. I am taking my time but it’s a great summer project and incredibly enlightening. As for the rest, interesting about SmartFlix. I have been wondering what the Landscape video is like and I actually did try to rent it once from SmartFlix but it was perpetually checked out (as were others I was interested in) so I finally gave up. But I am another one of those who would like to know what I’m getting for $75, so all opinions on the vids are very helpful. I meant to mention that it took several weeks for the rental video to arrive, apparently because of its popularity. There are two additional reviews of the video I mention among the links at the bottom of the post. I’ve rented many videos from SmartFlix and am sorry to hear that the artists don’t profit from the rentals. I’ve also purchased a dozen videos directly from the artists. I’ve been happier with the purchases when I’ve seen the videos first but have only returned one that was really awful. I think Schmid is a gentle and generous teacher in his writing and videos. I found doing the color charts just as he suggests in his book tremendously helpful. I wrote about them and posted pics on my blog. Here’s a link to my post about it (“Infinite Color & Joy”) on my blog . Thanks for your input, Jana. Here is the link to Jana’s post about “doing the charts“. I feel so lucky to have his Alla Prima book. Many years ago I remember trying to (desperately) buy it off Amazon on backorder. Somehow I managed to snag a copy, and it arrived in a beautiful leather cover. At first, I remember feeling overwhelmed and frankly disappointed. In my head I expected to be turning out paintings like Sargent or something. Still it’s stuffed with beautiful and even poetic reproductions. Your post reminds me that I should look through this book again. Thank Charley for your beautiful Website and your wonderful posts. I keep eagerly checking it day after day and learn so much from it. This is how I discovered Schmid and ordered his Alla Prima book. I had it sent to France and it took about 3 weeks to arrive. I’ve just leafed through it this morning and can only say it’s very promising! Hi folks, been doing some online research about illegal DVD copies and saw this post. I paint with Richard on a regular basis, and he actually says all the stuff in his book and DVD’s … repeatedly. It takes a while for things to sink in. We all do his color charts, and so does he periodically. We use our charts while we paint – makes it easy to match color of what we’re painting from life. Anyway, recently, there is someone on Ebay is who illegally copying and selling DVDs done by famous artists and selling them inexpensively. I’m inclined to order one just to catch the thief. Has anyone ordered art DVD’s from Ebay and gotten what seemed to be an illegal copy? Please let me know. At the request of Molly Schmid, Richard Schmid’s daughter, I have removed the passage in which I suggested renting from SmartFlix. She has confirmed what has been suggested by others, that SmartFlix uses a legal loophole to avoid paying any royalties to the artists or creators of the videos, as would be expected with normal video rentals. I will not recommend (or personally use) Smartflix in the future. …mischaracterizes what SmartFlix is doing. They are not exploiting a “loophole”. The law explicitly states that the owner of a particular copy of a copyrighted work video may dispose of it as (s)he sees fit. The law has been in place since 1908 so it shouldn’t be a surprise to anyone. Also, the “normal” video rental stores do NOT pay royalties to movie studios. Sometimes there are arrangements whereby a rental store gets free videos in exchange for royalties, or gets copies earlier than the public can. But any store could go down to Wal-Mart, buy the videos and rent them royalty free. Someone said Schmids books don’t seem to be widely distributed and mentioned Amazon. His books have been printed in a about 12-15 languages and the only reason you don’t see them on Amazon is that no one wants to sell them and the resale value holds almost as high as new. Once the printing is stopped as with his first books-the used value far exceeds new. A bit more research and less supposing would help this site. Brian, let me clarify for you. Galleries indeed buy ads. Normally, the cost of each ad is shared between artist/gallery. Additionally, Richard Schmid has been exhibiting in museums for 25 years. His work has been in magazines for that long too, almost always on the cover everytime there’s an article. Lastly, as he runs nearly all his sales today himself (Westwind)and he does advertise-his books and DVDs. How many articles and Schmid covers do you count for Art of the West in the last 25 years? Thanks for your comments, Bob. Speaking of “A bit more research and less supposing…”, If you read the article, you’ll see that my comment was not that his books are not widely distributed, but that Amazon and similar online booksellers do not generally sell new copies of Alla Prima directly, instead referring buyers to used booksellers who want unreasonable prices for a book that can be ordered new, and at a reasonable price, from Schmid’s own site. hello, i’m searching for an inexpensive shelfworn copy pf alla prima everything i know about painting by richard schmid. i am a fledgling artist trying to devolop “my stlye” and i think this is it. I’ve been painting alongside of Richard Schmid for 9 years, (as a Putney Painter) and have to say that his books and videos are worth the money. It’s a lot less expensive than workshops (which he doesn’t teach anyway), and he’s constantly updating the info in the book, Alla Prima, with each release. The video, June, is my favorite. BTW: Richard is just a plain, nice guy. So generous with his knowledge. He teaches art principles that can be used for any medium or subject matter. Yes, his books and videos are expensive, but now that he’s older, that is the bulk of his income, and it’s a business that he can leave to his daughter Molly. His instruction has raised the knowledge bar for many artists. Jeremy Lipking and Tony Pro, among others have come to paint with us on occasion, and they too have learned from Richard’s book. I’ve heard this directly from them. They are nice guys too. Yeah, Richard can start sounding a little lofty when speaking, but it’s an act. He’s got a generous attitude and wants to see all of us succeed. Thanks for the comments and personal insight, Lori. Since writing this post, I now have Schmid’s other landscape painting videos for comparison, and I think all four are very good, and certainly worthwhile for those studying painting. I agree that June is the best, and the one I would recommend newcomers start with. I continue to read and reread his instructional book Alla Prima, which I think is one of the best instructional books available for painters today, and I have purchased his recently published book of landscape paintings (which I am remiss in not having reviewed yet), and it is not only absolutely beautiful, but is also a book for painters to learn from, just by observation. I always recommend purchasing Schmid’s books and other materials directly from his website; not only does more of the profit go to the artist and his family, but the books are actually less expensive there than through online booksellers. What I was referring to in mentioning Schimd’s tone was the tone you might infer from the way Alla Prima is written if you haven’t heard Schmid speak. Once I heard him speak in his videos, it changed that tone when I subsequently read the book. He is a delight. I would love to meet him at some point, but I haven’t yet had that opportunity. Other readers can see Lori Woodward’s work on her website. Many will also be familiar with her as a writer and contributor to publications like American Artist, Watercolor and International Artist. It sounds like a fantastic way to get up close to his work and see the process. Thanks for this blog with so much information and further reading. Some weeks ago “discovered” richard schmid ( and Jon redmond etc).